We reveal the ins and outs of the AdWords SMS extension for businesses and how you can use it to increase productivity, upgrades, and customer satisfaction. How many times do you get an issue around the house, but decide to put off calling a professional until your house is flooded or you’re sat in complete darkness? The truth of the matter is, consumers hate calling businesses due to the long waiting times on the phone. Of course, this isn’t a fault of the business itself. Whether you own or work for a company with over 200 staff, or less than 10, there’s simply not enough time or personnel to satisfy everyone. That’s where Google’s message extension comes in. AdWords now allows you to include a text messaging option on your mobile ads. This exciting new development unlocks an entirely new audience of customers that prefer to use mobile messaging and SMS chat to communicate with businesses. So, when customers search for a service or business, they can see a text messaging icon next to the standard telephone option (see image below). The business can then send auto-replies to a pre-populated message – helping to reduce the number of phone calls, improve customer satisfaction, upsell products, and increase business productivity levels. It’s also a great way of capturing customer data. It sounds a little too good to be true, right? Luckily, it’s not. Below, you’ll find five handy ways to help you use and succeed with Google AdWords’ click to message. If you’re a mobile phone company or broadband provider, you can use click to message to upsell data bundles by including links to packages via SMS to customers looking for more. This can save them the hassle of calling up and going through the rigmarole of following an automated response. They can also do it on the go. Airlines and cinemas can take the opportunity to offer their customers first-class/V.I.P upgrades when they request information regarding their booking. Having no broadband and mobile signal to contact the provider is one of many issues customers face when moving house. Or getting a phone call from customer support regarding their issue whilst they’re at work also isn’t ideal. By using click to message, businesses can set an automated text for customers to send, containing a convenient time and number to reach them on. This not only helps improve customer satisfaction, but also cuts the time your support team waste on trying to reach them. With Christmas and the January sales fast approaching, retailers can give their customers a quick way to locate their parcel. Click the text icon (when searching for your company) and get them to simply fill out their tracking number before sending. You can then fire back an SMS that instantly updates them with the status of their delivery. Peace of mind for the last-minute Christmas shoppers! Whether you own a single hotel, a chain or run a comparison website company, Google AdWords’ click to message could really help the busy commuters and active consumers. Simply set up a populated text (when they click on the icon) to ask the customer where in the country they’d like to stay and the dates they’d like to check in. In response, you can send back options of availability and pricing. This way, your customers can make a booking on the go and won’t need to make unnecessary phone calls, search the internet, or dig through their email inboxes. The phone always seems to ring during the busiest times at restaurants. Remove the hassle and make booking a table more accessible by asking for the diner’s postcode to look-up their local restaurant. The reply sent can not only include their local restaurant, but also include a simple “reply YES to book” message to book their table. This allows diners to instantly secure a table and reduce the reluctant ones who don’t book and just decide to turn up without making a reservation. Setting up is simple. 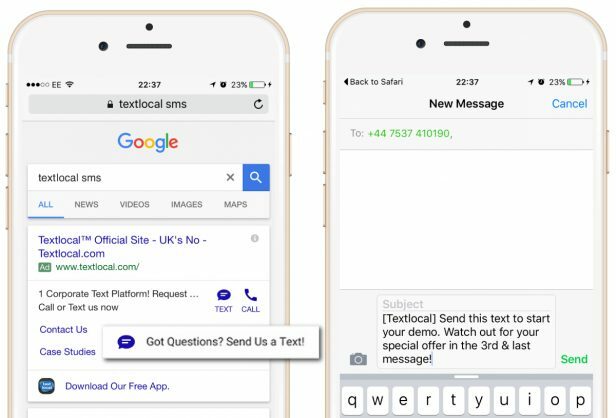 Start using Google AdWords’ message extensions with a Textlocal long number to receive text messages from your customers. If you don’t have a Textlocal account, sign up today for free. Once you’re up and running with an account, you’ll be able to send auto-replies to messages, add links and attachments to replies, pick your sender name, store customer mobile numbers online, forward replies to an email address or another mobile, and retrieve messages using our free SMS API. If you’re still not 100% sure whether click to message is for you, or require a little more guidance, take a look at our Google AdWords message extension page. You’ll find step-by-step information on the new feature and our award-winning Textlocal platform. Or if you’re interested in generating an extra revenue stream, we also offer AdWords message extensions to our resellers as well.